The two day risk conference called OpRiskWorld was an inaugural effort with an unusual format and an extremely diverse group of participants from the banking and regulatory world. It was the brainchild of a company called RiskBusiness, publisher of the magazine The Risk Universe, for which I write four times a year. The magazine is in fact being published late this month so that a report on the conference can be published, and I will try to be sure to post it here when available. But first, the format: each session had a topic and up to three panelists, with each session moderated by South Afrikaner Mike Finlay. Panelists ranged from authors to academics, an industrial psychologist, bankers, modelers and regulators, all focused in their work on the field of operational risk. No session lasted more than 45 minutes, eliminating the pontification factor. Each panelist had roughly 5 minutes to speak, then the panel was quizzed by Finlay, before being turned over to the audience for additional questions.It worked amazingly well. Of course some sessions ran over, but that time was made up in other ways by resizing networking breaks. No one dozed off, and 1-2 slide power points were used only twice. From left: Risk Business International CEO Mike Finlay, myself, and Howard Stein. The other factor that made the conference discussions so invigorating were the countries represented. There were a few of us from the United States, but other countries well represented included England, Canada, Australia, South Africa, Saudi Arabia, the Netherlands, Singapore, and Switzerland. The variety of perspectives made the conference especially unique. Dodd-Frank legislation; and the "too big to regulate, too big to fail" theme that persists in most extended discussions of the banking industry. More on that in my next blog post, or the report from the conference if it is covered there. I have been in Amsterdam nearly two hours now, and so far at least it's been a joy to travel. What could have been a major disruption in my airline itinerary turned out to be nothing that US Airways could not take care of smoothly. It probably helps that US Airways and American Airlines are merging. My booking was a considered choice: in one other bad weather situation, US Airways had anticipated a missed connection and re-booked me on to a later plane without bothering me at all. Furthermore, when we landed late at the airport, US Air personnel were standing just outside the runway to hand us our newly revised boarding passes and help us make connections. This time, the plane that was to fly me from Seattle to Philadelphia had a mechanical problem they found the night before. I got a text alert then phone alert to say that flight was cancelled. While I was on hold waiting to speak to someone about my fierce need to make the connection in Philadelphia to Amsterdam, their system rebooked me onto an American Airlines flight to Chicago, then picked me back up on US Air in Chicago. In each case, my seat assignments were upgraded without cost, so that I flew business class at no additional charge. And since the flight to Amsterdam was only half full, I was able to stretch out across three seats and sleep. While I wait for my room to be ready, I'm going back over my checklist. I bought two small plans for handling text messages and phone calls while I'm here. For mail, I am using the hotel's free wi-fi, and I fetch my messages manually. I carried my bag and briefcase with me through all the airports rather than check luggage and run the risk that it might not make the three connections that I did. I carried American money for that portion of the trip. When I arrived in the airport here, I used an ATM to get euros. I brought the right adapter for my electronic devices. If I have forgotten something, I don't yet know it. After I get into my room and unpack, I am off to downtown Amsterdam to look at some of the most magnificent paintings ever created, most of them by either Vincent Van Gogh or Rembrandt. I'm using the train system combined with the hotel shuttle, to get me where I need to go. Here's a peek at the cover for the second volume of Reflections on Risk. So many people to thank here -- my interns and students, first of all, for the quality of thought that went into these 26 research notes. Thanks also go to those who worked on the project -- Emily Oxenford, who edited the book; Stephanie Martindale, who tried to do the typography, despite the scourge of cancer; Jesse Brown, who has designed all the covers of our books; and then Emily Oxenford again, for producing the final interior typography. This kind of outstanding support is hard to get anywhere, and very much appreciated. Two proofs go into the mail for delivery here on Thursday, one for Emily, one for me. Then we'll make any adjustments here and then set the books to go live on Amazon.com probably by mid-next week. I am so pleased that I will be able to carry a proof to the operational risk conference in Amsterdam. · Victoria Tozer-Pennington, Editor, The Risk Universe. 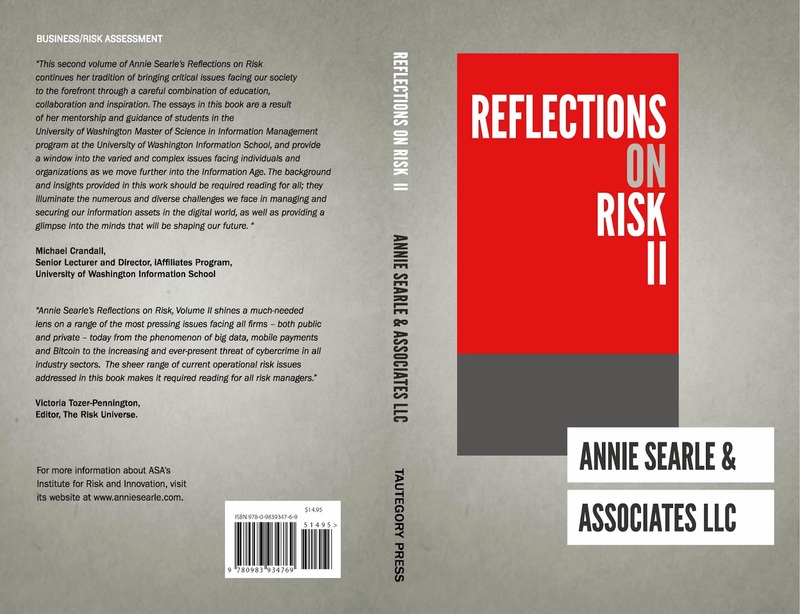 "A thought provoking collection of essays on risk management by Annie Searle and colleagues. Reflections on Risks, Volume II touches a range of contemporary topics from big data to mobile transactions and shines light on the risk management challenges facing organizations of all sizes and forms. 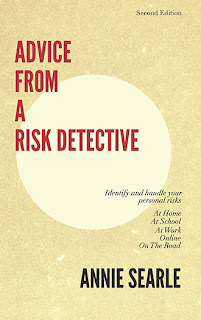 The essays offer much to ponder and reflect for both novices and experienced risk managers."